U.S. Sen. Kay Bailey Hutchison and Gov. Rick Perry are taking the term “retail politics” quite literally. The term usually refers to politicians’ public appearances that put them in direct contact with the people whose votes they are seeking. The idea is to see — and be seen by — as many voters as possible. But get this: The two leading Republican candidates for governor have come to Amarillo in recent days and made campaign stops at small venues that specialize in the sale of goods and/or services. Perry stopped the other day at a Coulter Street strip-mall shoe store and returned today for a meeting at a local real estate broker’s office. Hutchison campaigned recently at a Plains Avenue saddle shop and returned this week to a popular Paramount Boulevard restaurant. I was wondering: Whatever happened to those town square political rallies? They used to produce big crowds to cheer on whatever the candidate had to say. Gov. Perry and Sen. Hutchison could have sent their respective faithful into a frenzy at Potter County Courthouse square, creating a big news event for television and, of course, for the newspaper. The last major political public rally I attended, I think, was in 1988 when the Rev. Jesse Jackson campaigned for president in Southeast Texas. It was a big deal and Jackson energized a lot of people all at once. Perry and Hutchison, though, have settled for these intimate venues where only a few dozen people could meet them, shake their hands, pat them on the back and offer them good luck as they head down the stretch. I prefer the big rallies, either as a partisan or a journalist. And the big rallies still fit the description of “retail politics” that allow rank-and-file voters to see the candidates in the flesh. Amazing. I hope you don’t actually take yourself seriously, John. “Ethnic Pride”? It couldn’t possibly be that he’s a small businessman who will look out for the interests of other small businessmen, could it? In case you’ve somehow missed them, there are Leal signs in front of many non-mexican restaurants like Olive Garden, Chick-fil-a and Kabuki, just to name a few. Please only write something if it is worth reading. Your trashy blog posts make me sick. The above statement came from someone who objected — obviously — to an earlier blog posting. I’ll admit right here that I have missed seeing the Texas House District 87 campaign signs in front of the eating establishments noted in the respondent’s message. My intent merely was to comment on what I had physically seen in my travels around Amarillo. Perhaps I don’t get out enough and haven’t visited every single corner of our city, which comprises more than 100 square miles, over the past several weeks. We’re kind of spread out, right? So, most of the individual’s complaint about my blog post is noted with respect. I do object to one thing the individual wrote. The writer calls the posts “trashy.” I presume this person means all of them. I think some of them, at least, are rather clever. But that’s just me, I guess, tooting my own horn. Well, the weather prognosticators got it right concerning our winter. They told us we’d have a colder-than-normal winter, with more snow than normal. They shot and scored with that one. Now comes word that the Panhandle spring is going to be, um, more explosive and unpredictable than normal. That’s got to send chills up our spines if the weather folks have that one pegged, too. Does this mean the vaunted March winds will be windier? Will the storms dump more rain than normal? Will the hail stones be larger than usual? Will we see more tornadoes than we usually do? My wife and I will have visitors from out of town arriving in mid-March. It will be my sister and brother-in-law. Sis asked me about two weeks ago about the weather here in March. I giggled a little over the phone — and told her it’s difficult to describe the weather here. She’s been here twice already: once in December 1999 and once in late summer 2005. The spring is altogether different. The National Weather Service predicts that it’s going to be even more unsettled than usual. The experts are blaming all this on the Pacific Ocean water temperatures that are driving all these storms inland. Poor El Nino. “He” gets blamed for everything. This might not seem like a big deal, but it kinda-sorta is, given what I’ve witnessed in recent election cycles. Potter County Precinct 3 Justice of the Peace Frank Frausto has placed campaign signs throughout his precinct that urge voters to “elect” him to the office he currently occupies. He doesn’t use the term “re-elect,” because he hasn’t been elected yet to the seat to which he was appointed by county commissioners. Why make note of this? Well, during the 2009 Amarillo ISD trustee election, I saw signs touting the candidacies of two incumbents that said voters should “re-elect” them, even though neither of them hadn’t been elected to their offices. Both of them, John Ben Blanchard and Mary Faulkner, had been appointed to fill vacancies created by resignations. Thus, their signs weren’t truthful. Both of them won election, and they’re both doing fine jobs on the Amarillo school board. But kudos should go to Judge Frausto for using precise language in his effort to win election to public office. I was pleased and honored to take part in that discussion, which dealt with President Obama’s efforts to stimulate the economy and the impact they have had on this part of the country. The other participant was Kevin Riley, editor of the Dayton (Ohio) Daily News. Riley and I have discussed political issues with NPR on the air several times since 2008. I enjoy it immensely. But the more important point is this: NPR is gauging the impact of Beltway policymakers’ decisions on what is commonly known as “Flyover Country.” Dayton is a vastly different community than the Texas Panhandle. It’s in a swing state; Dayton leans Democratic and it has suffered grievious job losses in the wake of the economic downturn. Texas, on the other hand, is anything but a swing state; we are heavily Republican; the Panhandle leans even more Republican than most of the rest of the state; and our local economy is in relatively decent shape. Thus, our respective communities’ readers have different views on the state of affairs and on the Obama presidency. Thanks for asking us for our opinion, NPR. The campaign for the Texas House of Reps District 87 seat has taken on an interesting dimension. Mexican restaurants all across Amarillo are posting campaign signs touting the name of one of their competitors, who also is running in the Republican primary set for March 2. Victor Leal — who is campaigning against Walter “Four” Price for the GOP nomination to the District 87 seat — has run a restaurant in Amarillo for the past half-dozen years. I’m guessing he has drawn some business from many of the more established eating establishments that feature the same type of cuisine. However … when you drive around the city these days you see big “Leal” campaign signs on these competitors’ property. And it’s not just in the Potter County portion of Amarillo, which lies inside the District 87 boundary. I’ve noticed several such signs in front of Mexican restaurants near my neighborhood, which is in Randall County. I’m not yet sure what all this means, except that perhaps ethnic pride — Leal is Mexican-American — trumps the restaurant business’ competitive nature. I took part today in an interview that will be broadcast at 7 a.m. Sunday on National Public Radio’s Weekend Edition. It’s the third such interview I’ve done with NPR, along with Kevin Riley, editor of the Dayton (Ohio) Daily News. NPR has been good enough to gauge public opinion, as I see it, in Middle America on a whole range of issues. Riley’s constituents are quite different from ours here: Dayton is mostly Democratic in a swing state; Amarillo is mostly Republican in a heavily Republican state. But the Q&A turned to President Obama’s stimulus package and, specifically, what do people here think of it. I said that our folks here think little of just about anything the president does, given that the Panhandle voted 80 percent for John McCain in the 2008 general election. Obama had little political cache here when he took office a year ago. But despite our region’s distate and distrust of the Democratic administration, it’s instructive to note that we’ve been quite willing to take the money offered in the stimulus package. We’ve built roads and highways with it; we’re going to build a bridge in east Amarillo; our Legislature in 2009 used stimulus money to balance the state budget. So, which is it? Do we like the program or don’t we? It kind of reminds me of the saying about pork barrel spending: One man’s pork is another man’s enlightened self-interest. As long as the money comes here, why we’re just fine with it. 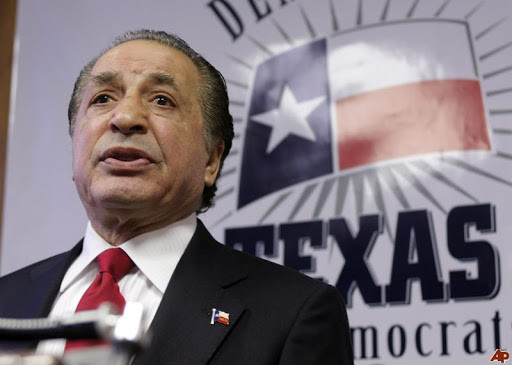 I’ll have to admit that I was intrigued when I first heard the name “Farouk Shami” in the context of the Texas governor’s campaign. Why the intrigue? It’s just so rare to see someone with an ethnic name running for high office in Texas. As one with such a name, I am drawn by candidates with relatively unusual-sounding family names. Shami is one of seven people running for the Democratic nomination for governor. He’s a fabulously wealthy hair-care tycoon who has bought a lot of advertising air time on TV to tout his message, which is that he’s a job-creator. Then he made the mistake of opening his mouth during a televised debate with fellow Houstonian and former Mayor Bill White. He said he’d pay the state $10 million out of his own pocket if the state couldn’t balance its budget. Hey, wait a minute. Doesn’t the Texas Constitution require a balanced budget? I guess he forgot that part. I don’t begrudge Shami’s right to run for governor. There’s something rather appealing about an immigrant, from the Middle East no less, seeking the state’s highest-profile office. It’s fair to acknowledge, though, that Texas has a history of voting against candidates because of the sound of their name. I can cite the Supreme Court race back involving appointed incumbent Xavier Rodriguez, who lost to challenger Steven Wayne Smith in the 2002 Republican primary. Rodriguez, appointed by Gov. Rick Perry in 2001, outspent Smith $500,000 to $9,500. Moreover, he was supremely more qualified than Smith, but still lost — primarily because Smith’s name was, um, more appealing to many Texas Republicans. Shami isn’t similarly qualified to be governor. But he does have money. And his offer to throw his cash around is a major turn-off to those who should take this office seriously. Brad Sham ran it back for a long gainer, so to speak, today at the Good Scout Luncheon sponsored by the Golden Spread Council of the Boy Scouts of America. I heard a quiet “amen” from someone sitting nearby in the crowded Grand Plaza Ballroom at the Amarillo Civic Center. Me? I wanted to stand, shout and applaud the guy. He talked about how his world of sports — with its superstars, glitzy stadiums, and all the glamor — isn’t “real life,” but that the credo of the Boy Scouts is as real as it gets. “Scouting is real life and it is what you carry forward” into adulthood, Sham told of the young people who take part in Boy Scouts. May we all carry the Scouts’ values forward every single day. I’m beginning to sense a slight shift in emphasis from one of the candidates for the Texas House of Representatives District 87 Republican primary. It came the other night from Walter “Four” Price of Amarillo, one of two GOP hopefuls seeking the nomination; the other candidate is Victor Leal, also of Amarillo. Price talked a bit more openly Sunday night in a TV interview about his long-standing relationship with District 87. Price said he grew up in the district, and has lived in it for most of his life. The contrast with his opponent, Leal, is unmistakable, who only recently moved into District 87 from neighboring District 86. And this campaign is beginning to take on a more aggressive tone as well, even though the two Republicans have few philosophical differences between them. I’m guessing the aggressiveness will center on the issue of who is more attuned to the district. The media are reporting now on questions that have surfaced about Leal’s residency and whether he’s actually living in District 87. And this thread is bound to make partisans on both sides a bit uncomfortable, given how unfamiliar many folks here are with contested races among non-incumbent state legislative candidates. David Swinford has held the seat since 1991 and has won re-election handily ever since. His pals John Smithee and Warren Chisum hardly ever draw opponents. So, with Swinford’s impending retirement from the House, District 87 voters are facing a serious debate between two serious and well-financed GOP candidates. What’s more, the winner of this battle is going to face Democrat Abel Bosquez and Libertarian James Hudspeth this fall. So, this campaign is just getting warmed up.